You may have heard of Braceability; a trusted company that sells various braces. In this article, I review the Braceability posture brace; what I thought of it, how it worked, and more information to help you to make the decision on whether to buy. Braceability advertises that you can put this brace on yourself, which is nice as you don’t need somebody there to help you tighten it. The cost of the brace, combined with the stellar reputation of Bracebility enticed me to purchase. I was aware before purchase that the Braceability is an upper back straightener only, pulling the shoulders back to improve posture. However, the company also claims that the brace can help with different issues, including, but not limited to: migraine relief, treatment of kyphosis, mild scoliosis, and recovery after back surgery, which made it an attractive option. I usually prefer to wear posture correctors that don’t pull the shoulders back, as research shows that exercise is better for that. I found and ordered this posture corrector from Amazon.com. There weren’t many reviews on the brace, but Braceability does have a good reputation in the industry. I decided to trust the company’s description and make the purchase. It seems like this is not one of Braceability’s best selling products. I think this may come down to the thick form factor of the brace since it is almost impossible to wear underneath clothing unless you want bulges. You may not want other people knowing that you are wearing it. The company disappointingly advertises that the brace is thin, but it isn’t. However, this doesn’t mean that the brace is completely useless. I ordered the large brace, but there is also a small size. I finally worked out how to wear it, but as I was trying it on I was unable to get it tight enough. One of the big selling points is you can put on yourself with no help. However, to tighten this I need my wife’s help since I can’t reach the adjustments. I do find it nice that it goes on like a backpack. Some posture brace wraps are so complicated with straps and wraps, but this one is simple to put on. It is also good to note that you can’t overdo it on tightness with this brace – you want it tight, but you do not want it to be too tight and uncomfortable. Some posture braces can be tightened to the point of being uncomfortable and even end up cutting off circulation. 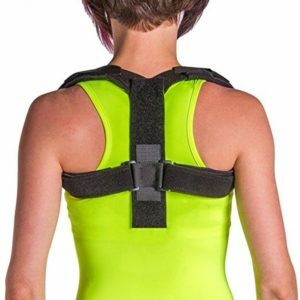 I know people who have felt discouraged after wearing a posture corrector, as the brace was too easy to tighten, and they experienced soreness because of it. The goal of a posture corrector is often to reduce back pain, and by over tightening the opposite (back pain) is achieved. This brace just slightly pulls the shoulders back, so it doesn’t feel unwearable. If you are the kind of person who wants to wear a posture brace all day, the Braceability may be an option. The Braceability is not a top of the line posture corrector; it is more of a value brace for simple posture correction to use at home. You can throw this on for a couple of hours of work in your home office. By doing so you get the health benefits of posture correction in a low cost, and easy to wear brace. Braceability recommends you don’t wear the brace too much at first. It’s best to ease yourself in until you get used to it. Many people find it useful to start out in thirty-minute increments, and gradually increase up to three hours, depending on their comfort level. It can take a bit of time to get used to wearing the brace for long periods of time, so bear that in mind. Washing the brace will keep it clean and suitable to use, but you wash it properly. To wash the brace, unstrap the Velcro pieces and then hand wash the straps in warm water with mild soap. Air dry, and don’t use high temperatures to wash it or dry it. The brace contains latex-free nylon and polyester material. The brace is comfortable to wear once it is on. It is convenient since it is a simple brace. One of the most cost-efficient options. It can be trimmed to fit better, but I did not need to do this. The brace doesn’t provide as much support as other posture braces on the market. Due to the thick form factor of the brace, it cannot be hidden under a shirt. You may need someone to help you adjust it if you cannot reach. Overall, I would recommend this brace if you’re looking for something simple and cost effective to use at home. However, if you want rigid or non-shoulder based posture support, that you can wear out and about, this is not the brace for you.